Hello all! Out of the front vents I can get luke warm heat, out of the defrost and floor vents it’s even cooler then the front vents. I checked the in and out hoses on the heater core and they are both at temp. I checked the blend actuator to the left of the glove box. When I move the switch from cold to hot the actuator does move. So I’m not too sure what could be the issue. Do you notice your temp gauge fluctuating showing the t-stat is opening and closing as it should? Are the hoses going into heater core hot as well as coming out of heater core? Temp goes from 186-193. The temp going into the heater core and out of the heater core feels the same and is hot to the touch. I know you said the blend door would move but does it move 100%? If they are the same temp then i would suspect the blend door is not opening all the way. Lol even the new trucks still have issues but with a higher payment haha. Luckily it's normally easily fixed it's just figuring out the issue is the hardest part. Where do you think I should start? What should I check first? Could possibly be the heater core needs replacing or flushed out. I have not personally done this so i would have to help you research how to do that. I can pull the heater hoses tomorrow and hook up the water hose to just flush the heater core. I’ve been there. 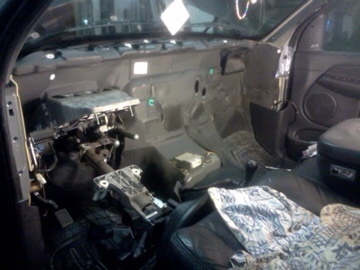 I replaced everything inside my dash. Because the parts did’nt cost much. It is the amount of work getting it done.